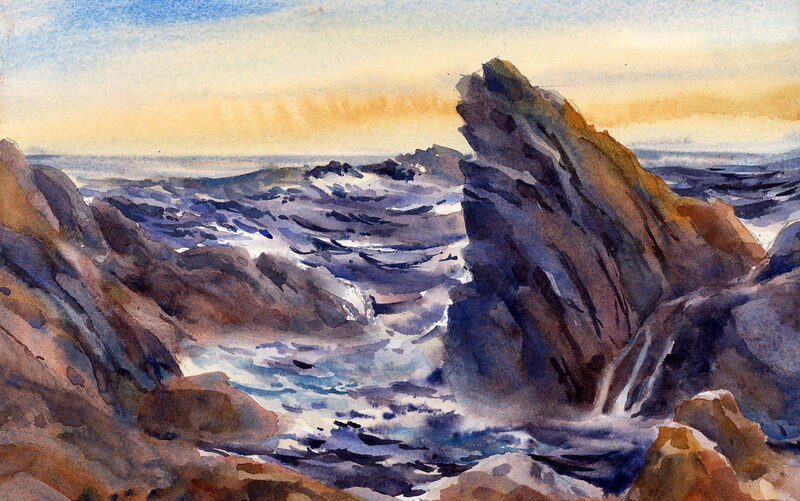 It was an honor to have been invited to demonstrate my watercolor painting technique in conjunction with the New England Watercolor Society’s Annual Signature Members Show in February 2018. 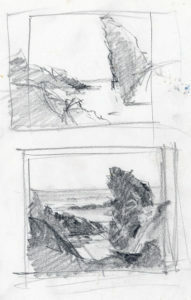 This is the painting that resulted from a series of conceptual thumbnail sketches worked out prior to the demonstration. The composition is derived from a place along the Gloucester, Massachusetts “back shore” along Atlantic Road. The area, also known as Bass Rocks is a favorite painting location. 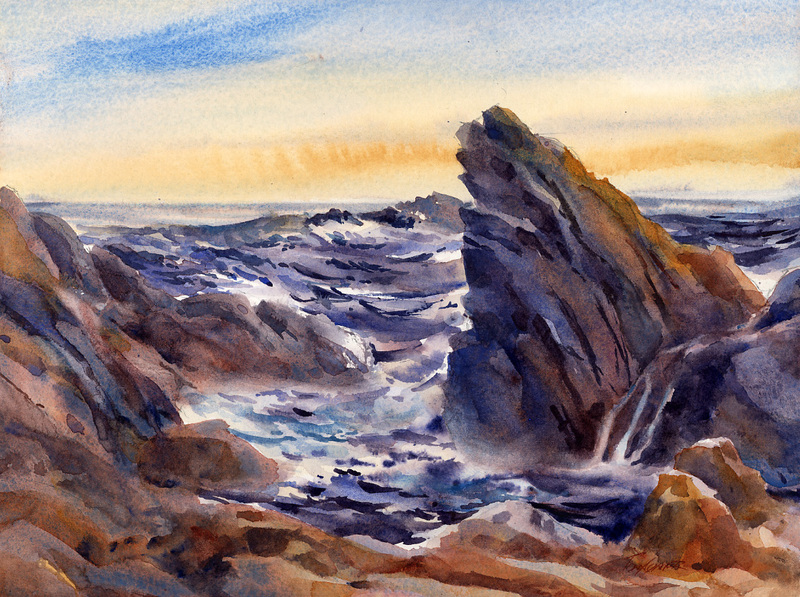 The finished demo, titled “Gathering Tide”, is shown above. It is based on a location at Bass Rocks – also referred to as the Back Shore – in Gloucester, Massachusetts. 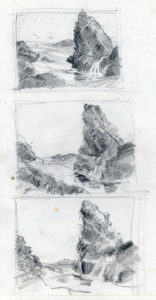 I have painted this scene, and this particular outcropping many times. It is a rugged coastline of rocks with an orange color. Most times, I paint them an orange hue in keeping with their actual appearance. This demo was partially focused on painting with the challenging pigment of Cerulean Blue. It’s a favorite of mine and gets included in just about every one of my paintings – even if only in small amounts. It’s also considered to be one of, if not the most difficult, watercolor pigments to work with. With a dominance of Cerulean, the overall painting would have a cool cast so the orange cast of the rocks was diminished, allowing it to become a warm contrast to the rest of the cool blues and blue grays. In concept, and in keeping with the overall cool dominance, the painting was to be a depiction of early morning light on a cool and gray day and an active incoming tide.